LILI is a program exclusively for NAIFA-Florida members who are volunteer leaders in their local association, or think they may have an interest in serving as a volunteer leader. The class meets once a month for 6 months, and will create a tremendous opportunity for personal growth in every aspect of the participant’s life. Members who participate will encounter the very best in personal and career development thinking presented by outstanding leaders, and experience an attitude and environment conducive to deep, prolonged emotional, intellectual and professional growth. Information, practical tools, and stimulating dialogue are provided through interactive group sessions, small-team building sessions and personal reflection time. LILI isn’t for everyone, and is limited to 14 participants per class. In addition to other selection criteria, candidates have to be well-rounded, financially stable individuals of good character and reputation. Candidates also must demonstrate a desire to make a positive difference in their local association, the industry and their community. Candidates are required to have two full years of insurance or financial services business experience, and must be approved by their local association and the NAIFA-Florida LILI Candidate Selection Committee. Candidates will also be asked to sign a promise to give back two years of volunteer service to their local association. 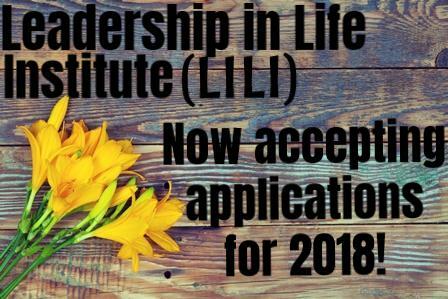 NAIFA-Florida’s highly-popular Leadership in Life Institute (LILI) is now accepting applications for 2019 – registration deadline is April 1, 2019. This year’s class will be held in Tampa. Friday – 6/22/2018 (Tampa). Graduation will be held Thursday July 19 (in Orlando, in conjunction with the NAIFA-Florida state conference). Tuition is $890 (does not include hotel, travel, or meals). NAIFA-Florida Education Foundation is pleased to offer $200 scholarships to the first 10 students who apply. (NOTE: Scholarships will be granted on a reimbursement basis following class completion and student LILI experience video testimonial submission. Click here for a testimonial video from 2017 LILI graduate Michele Wilkinson. Need more information? If you think LILI is right for you, or that it is something you need, please contact Steve Saladino at (813) 872-5869. Complete your application now! Click here for the latest LILI Student Application. Get Connected!! Join LILI Alumni Networks Today on Facebook. For more information, click here.